I have mixed feelings about the wild turkeys that visit. They have been known to peck at the ground-level windows of my house with such vehemence that I could easily envisage a flock of turkeys promenading around the living room. But my heart went out to the turkey I watched being murdered by a coyote a couple of weeks back--right outside of my vegetable garden. 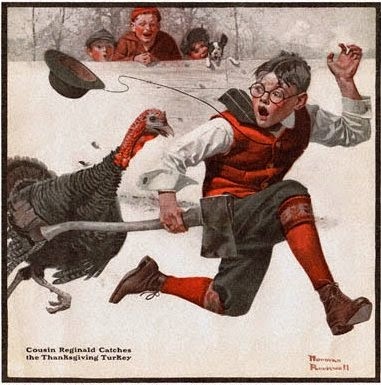 I'm thankful I wasn't that turkey. And no, I'm not having turkey for dinner today. How to Beat the Market Makers at Their Own Game: Uncovering the Mysteries of Day Trading (Wiley, 2014) is not the most compelling advertisement for Cyber Trading University, of which the author, Fausto Pugliese, is the founder and president. It’s by turns simplistic and obscure, repetitious and “gappy.” Traders may be able to make money following Pugliese’s advice; as the rather gruesome saying goes, there’s more than one way to skin a cat. I’m criticizing the way book is written, not the message—although I admit to finding the message troubling at several points. So let’s turn to the message, without further value judgments. But how can the trader identify the right stock? Pugliese lists nine rules: (1) stay away from stocks that are higher than $30 a share, (2) avoid brand-name stocks, (3) steer clear of stocks with insufficient tier depth, (4) stay away from stocks with low trading volumes, (5) avoid stocks with high trading volumes, (6) pass up stocks with very few active market makers, (7) keep your spread to a minimum, (8) follow the stock trend both in pre-market and during the day to get a sense of direction, and (9) look for market maker traps. Once the trader has created a list of tradable stocks and found the ax for each, “the only thing left for you to learn is when to buy a stock and when to sell it.” (p. 101) The answer is simple: the trader has to pay attention to support and resistance levels. Well, actually that’s not quite it because Pugliese has ten trading rules of the road, including no overnights and no dollar cost averaging. If you trade options, you’d do well to have Scott Nations’ Complete Book of Option Spreads and Combinations (Wiley, 2014) in your reference library. It’s an intermediate-level book that explains the structure of more spreads than most people will ever trade but that they should understand nonetheless. A case in point: a conversion or a reversal, a combination that is rarely executed as a package but that “a smart retail trader might end up having on.” (p. 209) It’s better to know in advance what this position is and how to deal with it. In eleven chapters this book deals with vertical spreads, covered calls, covered puts, calendar spreads, straddles, strangles, collars, risk reversal, butterflies, condors and iron condors, and conversion/ reversal. Every strategy is encapsulated in cheat sheets and, more importantly, is illustrated with examples, complete with tables and figures. 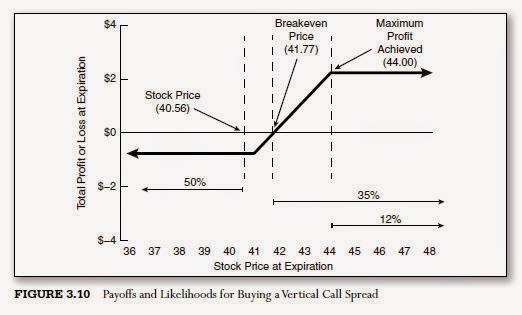 Here, for instance, is the graph of a vertical spread he analyzes, which includes the probability of profitability—something he explains how to calculate on the previous page. Unlike Nations’ previous book, Options Math for Traders, this one is math-lite. He confines his discussion of option pricing to a single chapter and refers the reader to his website Option Math to download a free spreadsheet that calculates theoretical option values using the Black-Scholes model and inputs supplied by the user. 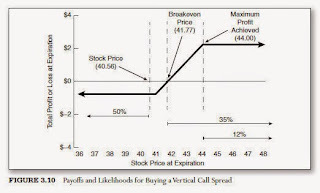 But it provides an excellent conceptual framework for understanding spreads and combinations. With the help of this book the reader can progress from being a trader who uses options to an options trader. For three years now Columbia Journalism Review Books has been publishing what the book’s editors (in this case Dean Starkman, Martha M. Hamilton, and Ryan Chittum) consider to be the best business writing of the year. This year’s collection contains 31 articles on topics ranging from the criminal—“Dead End on Silk Road” and “London’s Laundry Business” (and no, it’s not about laundering clothes but rather dirty money and dirty reputations)—to the political—“Washington’s Robust Market for Attacks, Half-Truths” and “He Who Makes the Rules.” There are articles on taxation—“Amazon’s (Not So) Secret War on Taxes” and “How the NFL Fleeces Taxpayers"—as well as on unhealthy business—“Merchants of Meth: How Big Pharma Keeps the Cooks in Business” and “The Extraordinary Science of Addictive Junk Food.” The section on creative destruction has five articles, that on frenzied finance has seven. And there is, of course, the requisite set of articles on Silicon Valley. I’m not sure how many of these articles made their way into books. I know that Kevin Roose’s “One Percent Jokes and Plutocrats in Drag: What I Saw When I Crashed a Wall Street Secret Society” was recycled in his Young Money. This isn’t the place to parse economic data. Suffice it to say that CEOs are making much more, workers are treading water, and shareholder value is rising. Goals are no longer balanced. For over 15 years Doug Kass, president of Seabreeze Partners Management, has been a contributor to TheStreet.com and has by his own estimate written over 30 million words in more than 50,000 columns (typically at least 15 a day). He makes the rest of us look incredibly lazy. In this his first book, Doug Kass on the Market: A Life on TheStreet (Wiley, 2014), Kass, with the help of his editor Daniel Robinson, offers a selection of these columns. They document the thinking of a conservative short seller (or, the stuffed animal the cover portrays him holding, a teddy bear) over a range of market conditions. The book is divided into nine sections: where it began, short-selling, lessons learned, the great decession: subprime and credit/debt crisis, recovery, against the grain, Wall Street personalities, Buffett watch, and surprises. There’s some overlap, and some understandable repetition, but Kass covers a lot of territory in more than 500 pages. I was most interested in his investing advice. Let me share a few of his pearls of wisdom here. “Avoid illiquid and heavily shorted stocks. If you don’t, eventually a short squeeze will be the outcome, and there will be heavy losses with it. Since I devote this blog almost exclusively to books on trading and investing, I’m always interested in what other people read. In 2011 Doug Kass described The Most Important Thing by Howard Marks as “a tour de force, … the single-best investment primer I have read” since Graham and Dodd’s Security Analysis (1934) and Graham’s The Intelligent Investor (1949). I wasn’t so effusive in my review. Fans of Warren Buffett will undoubtedly turn immediately to the section that describes Kass’s trip to Omaha to ask questions as a “credentialed bear,” one who wrote a column in 2008 explaining his rationale for being short Berkshire stock. They won’t be disappointed. The final section of the book is devoted to his annual list of possible surprises for the coming year, a practice he started in 2002. I don’t know why anyone would ever want to go through this exercise since, as Woody Allen said (and as Kass quotes him), “I’m astounded by people who want to ‘know’ the universe when it’s hard enough to find your way around Chinatown.” (p. 428) Predicting the future is harder yet. To Kass’s credit, he lays everything out—the prescient as well as the dead wrong. I have fond memories of spending countless youthful hours on a neighbor’s screened-in porch playing Monopoly. When life intervened—to go home for lunch or at the end of the day—and the game wasn’t yet finished, the board remained set up, ready for us to pick up where we had left off. And so, when I saw that a new book on Monopoly was coming out in February, 2015, I rushed to read the advance galleys. I was amply rewarded for my time, although I must admit that something of a pall was cast over my memories. 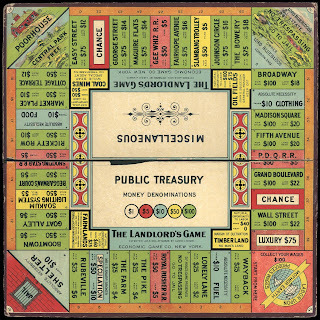 Mary Pilon’s The Monopolists: Obsession, Fury, and the Scandal Behind the World’s Favorite Board Game (Bloomsbury) is a well-crafted tale of how Monopoly came to be and how the wrong person was given (actually, falsely claimed) credit for creating it. Under the best of circumstances attribution is a tricky business. For instance, every school child is taught that Thomas Edison invented the light bulb, and yet he was only the most famous in a string of inventors who contributed to electric lighting. Volta developed the first practical method of generating electricity in 1800, Humphrey Davy invented the electric arc lamp in 1802, Warren de la Rue developed a platinum filament light bulb in 1840, Joseph Swan came up with a light bulb that used carbonized paper filaments in 1850, and Henry Woodward and Matthew Evans filed a patent in 1874 for an electric lamp with carbon rods. They sold their patent to Edison in 1879, the same year in which he filed a patent for an electric lamp with a carbon filament. And, of course, Edison did not work alone; he had a large team of researchers. It is more accurate, therefore, to say that Thomas Edison and his team invented the first commercially practical incandescent light. 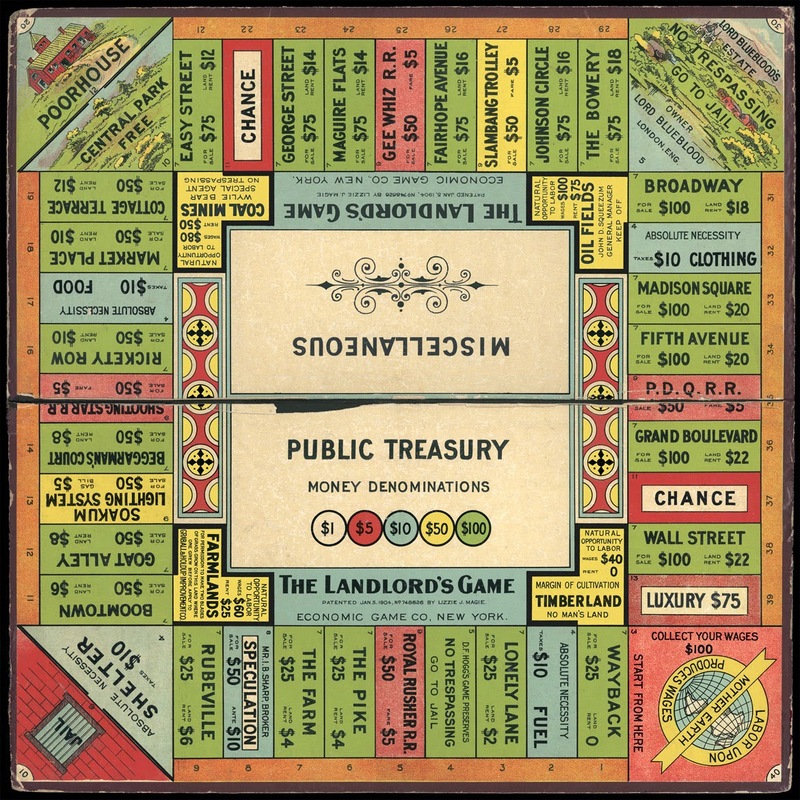 In the case of Monopoly, the journey from first iteration to wildly popular board game was more incremental. But one thing we can now say with certainty. Charles Darrow, the unemployed salesman whose alleged invention—or so the official story went—rescued both Parker Brothers and Darrow from financial collapse, did not create the game. He simply reaped its benefits. In the beginning was a woman, Elizabeth Magie, a follower of the anti-monopolist Henry George. During the day she worked in the Dead Letter Office, in the evening she pursued literary and theatrical ambitions and dabbled in invention. At the age of 26, for instance, she patented a gadget that improved on typewriter technology. She also taught classes about George’s single tax theory. Wanting to expand her audience for George’s theory, she came up with a board game, which she called the Landlord’s Game. “It is a practical demonstration of the present system of land-grabbing with all its usual outcomes and consequences,” she wrote in 1902. “[S]omewhat surprisingly, Lizzie created two sets of rules: an anti-monopolist set in which all were rewarded when wealth was created, and a monopolist set in which the goal was to create monopolies and crush opponents.” (p.33) We know, of course, which set of rules the public came to embrace. A group of Quakers moved to Atlantic City to “establish a healthy, fresh-air community, complete with modest accommodations and prayer lodges.” (p. 80) Well, you can pretty well guess the next stage in the game’s development, though I’d wager to say that you don’t know why Baltic Avenue is less valuable than Marvin Gardens or that ‘Marvin Gardens’ turned out to be a tell-tale copying error (the correct spelling was ‘Marven’). Unfortunately it’s a short step from the innocent Quaker innovators to the dark side of the game’s history. Pilon, a staff reporter at The New York Times, does a brilliant job of exposing questionable corporate mores and individual dishonesty and greed. The heroes of the book, such as Ralph Anspach—who uncovered the provenance of Monopoly while engaged in costly litigation over his Anti-Monopoly board game decades later, struggled; the villains thrived. The game, of course, continues. It no longer, however, comes with a printed copy of Darrow’s rags to riches story. Here I’ll highlight three concepts that are basic to Brandes’ framework: investing versus speculation, value philosophy, and risk. There’s some wiggle room in using these guidelines. As Brandes writes, “Utilities, which are usually buffered from economic influences, may allow a little more leniency on the debt-to-equity or annual earnings growth tests, while for a potentially more volatile technology-based business, these would be two must-pass criteria before we would even consider it.” (p. 73) Moreover, lest one think that value investing can be reduced to a straightforward four-step process, the professional value investor will typically subject any company in which he is interested to much more detailed analysis. Risk in its true sense cannot be measured in the way that volatility and similar mathematical notions can. But it follows a general pattern. Investors lose money when they overpay, when they sell at a loss (that is, when they didn’t wait patiently for the stock to turn around), when the company itself deteriorated, and when they strayed from fundamental investing discipline and lost focus. Note that only one of these reasons for a loss of capital is outside the control of the investor. In the investing world, where uncertainty is said to reign supreme, that definitely shifts the balance of power. The Stock Trader’s Almanac is now in its forty-eighth edition. It remains a must for traders who use seasonal factors to time the market. The spiral bound, navy-covered almanac opens flat for easy access to its data or for jotting down notes. The format remains essentially the same, with a calendar section, a directory of trading patterns and databank, and a strategy planning and record keeping section. The calendar section has on facing pages historical data on market performance (verso) and a week’s worth of calendar entries (recto). January’s verso pages, for example, give the month’s vital statistics, January’s first five days as an early warning system, the January barometer (which has had only seven significant errors in 64 years), and the January barometer in graphic form since 1950. Each trading day’s entry on the recto pages includes the probability, based on a 21-year lookback period, that the Dow, S&P, and Nasdaq will rise. Particularly favorable days (based on the performance of the S&P) are flagged with a bull icon; particularly unfavorable trading days get a bear icon. A witch icon appears on options expiration days. At the bottom of each entry is an apt quotation. There’s about a five-square-inch space in which to write. New this year is a three-page section in which “some of the best minds on Wall Street” offer their outlooks for 2015. What other seasonals are powerful? The best six months strategy still works. “Investing in the Dow Jones Industrial Average between November 1st and April 30th each year and then switching into fixed income for the other six months has produced reliable returns with reduced risk since 1950.” In 64 years the Dow gained 17432 points during these months and lost 1066 points during May through October. The S&P gained 1790 points in the same best six months versus 75.5 points in the worst six. And applying a simple MACD timing indicator nearly triples these results. The first months of quarters are the most bullish, and the first trading day of the month outshines all others combined. You read me right: “Over the last 17 years the Dow Jones Industrial Average has gained more points on the first trading days of all months than all other days combined. While the Dow has gained 8868.89 points between September 2, 1997 (7622.42) and May 16, 2014 (1649.31), it is incredible that 5468.22 points were gained on the first trading days of these 201 months. The remaining 4003 trading days combined gained 3400.67 points during the period. This averages out to gains of 27.21 points on first days, in contrast to just 0.85 points on all others.” (p. 86) By the way, 2014 did not continue this tradition; during the first trading days of the first five months it lost 562.06 points (-135.31, -326.05, -153.68, 74.95, and -21.97). This almanac is chock full of data that will delight those traders who believe that past is prologue. Even those who are skeptical have to pay attention to data that seasonal traders rely on and that therefore tend to move markets. Active portfolio managers are judged by the outcomes of their investing strategies, such as risk adjusted returns. More often than not, these returns come up short when measured against standard benchmarks. Understandably, investors ask why they should pay management fees for subpar active management when they could park their money in passive index funds at a significantly lower cost. In Managing Equity Portfolios: A Behavioral Approach to Improving Skills and Investment Processes (MIT Press, 2014) Michael A. Ervolini, CEO of Cabot Research, offers the beleaguered portfolio manager some suggestions on how to go about improving. That such a book is deemed necessary is somewhat worrisome. Retail investors and traders, whose portfolios are dwarfed by their institutional brethren’s and who don’t collect hefty salaries for managing their own money, have been deluged with works offering much of the same advice—beware of behavioral traps, focus on process rather than outcome, keep a trading journal. Fortunately, since Cabot Research provides “innovative analytics to help money managers improve portfolio performance,” the book also highlights some of the metrics that all traders and investors can use to assess and improve their own performance. Instead of rehashing the findings of behavioral finance, which I’ve written about on numerous occasions, I’ll focus on the book’s main organizing principle and some of its attendant metrics. The manager must then analyze the data. “For example, to look deeper into your adds to winning positions, you might create a graph with an x-axis indicating time and two distinct y-axes, the one on the left indicating cumulative return, and the one on the right indicating the size of the adds.” (p. 236) And finally, he must draw up an improvement plan. Ervolini walks the reader through a few ways to analyze buy, sell, and position sizing decisions. Sell decisions can be critiqued through the lens of holding time—whether positions harvested early are helping or hurting performance. As for buying or adding to positions, you can analyze whether your “high conviction” purchases are outperforming those in which you have less confidence. The upshot is that you can only know your strengths and weaknesses if you find a way to measure your investing behavior—a way that is, the author recommends, simple (otherwise you won’t do it) and granular (otherwise the results will be too general to be useful). Separate out your trading activities, and here, I would suggest, you can include such things as order type and fill, response to market volatility, source of investment idea, etc. You never know what kinds of analytics might be helpful until you start collecting data and mining the results for performance gold. A philosopher by training, a trader and investor, a book lover.